Hatters centre half Sonny Bradley has vowed there is no way that Town’s players will ‘throw away’ their chance of promotion this season after manager Nathan Jones left last week. The Welshman opted to head to the bet365 stadium last Wednesday and became Stoke City boss, leaving the Hatters second in League One. They remained in that position after a 1-1 draw at third placed Sunderland on Saturday, as Bradley said: “We’ve just got to carry on. “We’ve put ourselves in a great position in the first half of the season, there’s no way we’re going to throw it away now with the changes that could possibly happen. “I think mentally we’re too strong, we’re too tight as a group to throw it away. Bradley, who was signed by Jones in the summer, admitted it had been a surprise to hear of the manager’s departure when the news broke. He continued: “I don’t think anyone had a clue. 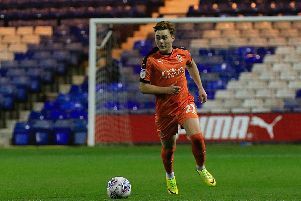 “There was some speculation on Tuesday, Tuesday night, it came out of nowhere and then obviously on Wednesday, Gary Sweet just sat us all down and told us the news. When asked if the squad had felt let down by Jones’ decision to leave during such a crucial stage of the campaign, Bradley said: “No, I don’t think anyone feels that way. “Nathan’s been brilliant to a lot of the boys in there, he’s helped put us in the situation that we’re in now, I think we can only thank him for that. “Obviously an opportunity has come up for Nathan to go on and better his career and I don’t think you can be upset at the man for making that decision. “It’s just one of those things in football and we’re too strong to throw it away now. Bradley believes that whoever does come in will have the full support of the squad too, adding: “We back Gary and the board and I don’t know how long it might take, but we fully expect them to make the right decision, the right appointment. “If someone does come in, we’ll be ready, they’ll have our respect straight away, they’ll understand they’re coming into a club with high expectations now."